Why would you need a baby memory book for your children? Well, as a new parent, you think you have all the time in the world with your little one. However, you blink and they take their first steps. Blink again, and they are off to school. One more blink, and you are sending your baby (because he or she will ALWAYS be your baby) off to college to face the world on their own for the first time. We’ve all heard the old saying, “Time flies when you’re having fun”. While raising your little ones may be hectic and sometimes stressful, you look back and realize you were having fun and just as the saying states, “time flies”. 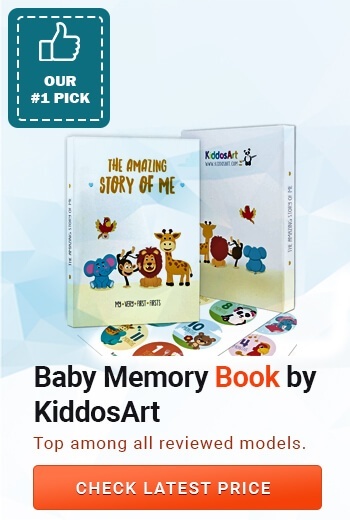 Baby memory books are a great way to record baby’s milestones and create a story of her childhood that will always be cherished – long after your baby has babies of her own. The Lovely Sprouts Baby Memory Book is one of the best baby memory books for twins. Being that it is gender neutral, this memory book allows you to record milestones reached during baby’s first twelve months as well as a page for each year until his/her 5th birthday. This baby book from Lovely Sprouts is designed for all types of families – one of the best baby books for single moms or dads, adoptive parents, LGBTQ parents, and grandparents. Lovely Sprouts is a family-owned and operated business that came to be for the purpose of providing quality products that help you celebrate the good things in life – and what is better to celebrate than you baby’s first milestones! Lovely Sprouts understands that families come in different forms and believe all families (no matter the dynamics) should have great products to document their journey. Lovely Sprouts is dedicated to helping provide resources (such as clean water) to disadvantaged children all over the world – a portion of all proceeds is sent directly to organizations that work toward this goal. Keepsake envelope to store special items (lock of hair, first lost tooth, hospital bracelet). Includes 1 page for each of baby’s first 12 months and a page for each year up to 5. Includes a page for each of the following holidays: Christmas, New Year, Easter, Passover, Hanukkah, Thanksgiving, Halloween, and Valentine’s Day. Includes the following milestones: First tooth, first words, first meal, first bath, first time crawling, first time walking, and first day of school. 57 pages containing gender-neutral illustrations that is a combination of journal, photo album, and scrapbook. Does not include ink pad for hand and footprints. 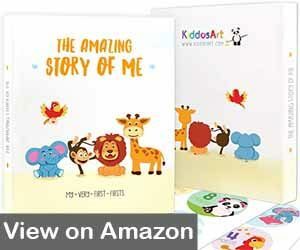 The Baby Memory Book by KiddosArt, “The Amazing Story of Me”, is one of the best 5-year baby memory books on the market. 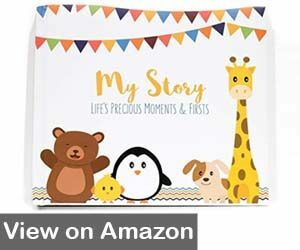 Filled with beautiful artwork, this panda, giraffe, lion, monkey, and elephant baby memory book offers an adorable background to record all your little one’s most momentous occasions. KiddosArt is a family brand that is committed to providing creative and unique baby products that are functional, safe, and fun. The KiddosArt family is also dedicated to providing resources for underprivileged children all over the world and are dedicated to using products that are safe for baby and safe for the environment. 72 pages filled with colorful animals – lion, monkey, elephant, giraffe, and panda. Allows you to capture baby’s ultrasounds and baby shower before birth. Includes a teething and growth chart as well as a place to record your baby’s monthly growth. Includes a page to record baby’s family tree. Includes space for the following holiday: New Year, Christmas, Easter, Mother’s Day, Father’s Day, Thanksgiving, Valentine’s Day, St. Patrick’s Day, 4th of July, Halloween, and a blank special holiday for holidays that are not included. Holds up to 104 photos – pages for pregnancy photos and baby photos. Made with Eco-friendly pages and printed with acid-free, soy-based ink. Pages cannot be removed to make the book fit different family dynamics. 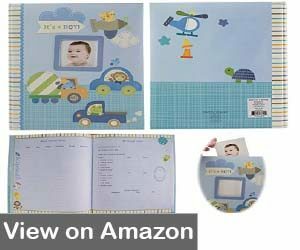 The Ocean Drop Designs Baby Memory Book for Boys is one of the cutest and best baby boy memory books to capture your little one’s first 3 years. This memory book is filled with hand-drawn illustrations as well as inspiring phrases and quotes – and provides room for all the most important milestones that occur during baby’s first years. The founder of Ocean Drop Designs is the mom of three little ones of her own. She understands the importance of recording baby’s most important milestones. The beautiful quotes and phrases are designed to provide an inspiring backdrop for baby’s precious moments that will inspire your child throughout his life. Includes 56 pages with room for up to 65 photos. Includes keepsake envelope for special items. Before birth pages include: When we found out about you, pregnancy and ultrasound photos, Baby Shower, and Family Tree. After birth pages include: baby’s arrival, birth announcement, first visitors, hand and footprints, growth chart, milestones through 3 years, and holidays and celebrations. Inspirational messages that promote gratitude, kindness to others, and love. Only holds 4 x 6” photos. The RubyRoo First Year Baby Memory Book, “All About Me”, is another one of the best baby boy memory books available. This woodland baby memory book includes a first-year month-by-month milestone section, a baby journal, lots of room for photos, and a five-year scrapbook to record all your little one’s important firsts. RubyRoo Baby’s main goal was to create an heirloom-quality baby memory book that will work for all types of families – single parents, LGBTQ families, adoptive families, and any other family dynamic. The memory book is designed so that families can easily remove the sections/pages that do not apply to their situation. 1% of all profits are donated to a charitable organization. 56 pages with illustrations and carefully selected captions that fit any family dynamic. Capture all of baby’s firsts – first tooth, first food, first bath, first time crawling and walking, first day of school. Includes the following holidays: Christmas, Easter, New Years, Thanksgiving, Hanukkah, Passover, Holi, Eid al—Fitr, Eid al-Adha, Diwali, Halloween, and Valentine’s Day. Easy to remove pages to eliminate holidays and celebrations that your family does not celebrate. This baby book is heirloom quality, with a hard cover and concealed spiral binding (cannot see spiral binding on the outside of the book). Does not include a family tree page. The Lucy Darling Baby’s First Year Memory Book is designed to allow busy parents to create a simple book of firsts. 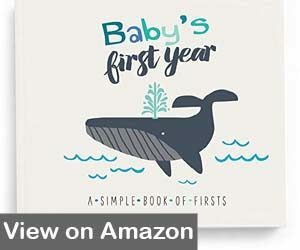 From pre-baby pages to first five birthdays, these 48 pages allow you to quickly record all of baby’s firsts – including first word, first steps, first birthday, and first day of school. The Lucy Darling brand began when a graphic design artist was expecting her first child. In her excitement to welcome her little one to the world, she began creating sticker sets to share her excitement with the world. 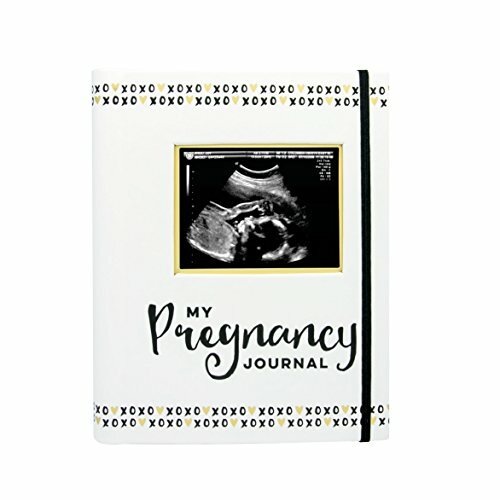 Lucy Darling is committed to providing high-quality, unique products from pregnancy belly stickers to memory books to closet dividers. The Little Captain memory book includes 2 pre-baby pages for pregnancy photos, ultrasounds, and a note from mom or dad. Includes 3 pages for baby’s arrival day – with special spaces for footprints, hospital bracelet, and birth announcement. 12 monthly pages to record milestones throughout baby’s first year and 5 pages to record each of baby’s first 5 birthdays. Includes a family tree as well as pages for photos of baby’s first home and the cost of things the year baby was born. Printed with eco-friendly, soy-based ink. Cannot easily remove pages that do not fit your family dynamic. The Stepping Stones Baby Memory Book by C.R. Gibson comes in two designs – one for a boy and one for a girl. 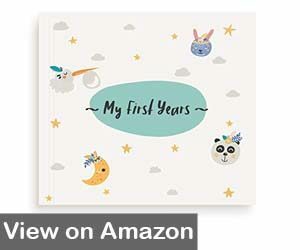 This hardback baby memory book is sturdy with beautifully illustrated pages that allow you to record all your little one’s firsts – from birth to their 5th birthday. R. Gibson was founded in New York City in 1870 and quickly became a leader in providing high-quality stationery, letterheads, and marriage certificates. Their first baby book went into print in 1898 and the rest is history. Selling over 5 million journals each year, C. R. Gibson is committed to providing quality, innovative products that make recording your baby’s firsts simple and fun. Includes pages for pre-birth – pregnancy photos, ultrasounds, baby shower, and all about mommy and daddy pages. Also includes a page for an extended family tree. 12 full pages for each month of baby’s first year. 5 birthday pages to record each of baby’s first 5 birthdays. Birth pages that include a place for footprints, birth announcement, and photos. Capture all of baby’s firsts, including holidays, celebrations, and first day of school. Would not work well for all family dynamics. 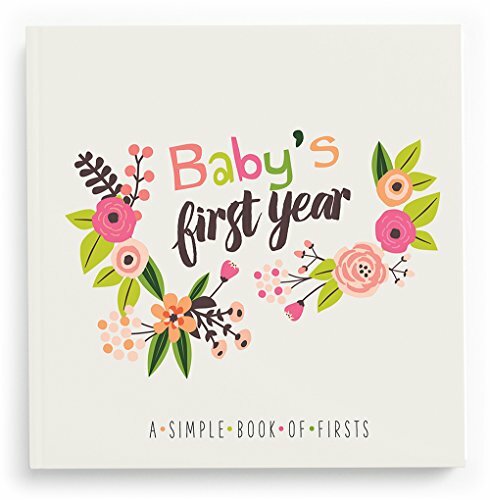 The Mae KIDS First 5 Years Baby Memory Book is a wonderful way to capture all of baby’s firsts and important milestones – from first steps to first holiday to first day of school. The 48 pages of scrapbook-style pages allow you to record all noteworthy events with photos, descriptions, and stickers. Mae KIDS products are designed specifically for kids by those who know them best – moms. Mae KIDS is dedicated to providing high-quality products that allow you to capture your little one’s most important firsts and memorable events. Mae KIDS is proud to provide products that are people and environmentally-friendly. 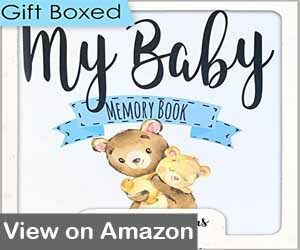 This 48-page unisex baby book includes a keep-sake box to preserve and protect your baby’s most important milestones. Includes an ink pad that is safe for baby for recording hand and foot prints. Holidays include Christmas, Easter, New Years, Thanksgiving, Halloween, Mother’s Day, and Father’s Day. Includes 12 pages for recording baby’s monthly progress, firsts, and other milestones. Includes keepsake envelope for baby’s hair, teeth, and hospital bracelet. May not work well for all family dynamics. Baby memory books as we know them have been on the market since the early 1900s. Before that, records were kept of baby’s growth and progress, but for purely scientific reasons. Darwin was one of many scientifically-minded parents who kept a detailed record of such things as baby’s digestive events, ongoing notes outlining baby’s development, and other pertinent information for research. This information was used to improve child care during a time when babies often did not survive their first year because of disease and unsanitary living conditions. Before the 20th century, infant mortality rates were very high. As scientists and physicians studied the records being kept, they learned more about how to lower the infant mortality rate by identifying signs that indicated problems early enough to possibly treat them successfully. The 20th century also heralded better living conditions – better sanitation practices, better child care from a health perspective, the introduction of vaccines to prevent some illnesses and diseases – which drastically decreased the infant mortality rate. Rather than saving money during the pregnancy for a postmortem baby picture so they would have a memory of their lost baby, parents began to believe their baby’s would survive – so, they began recording baby’s milestones so that their child would be able to look back on the memories of their first years. Since the early 1900s. the baby memory book has been mass-produced – with the earliest memory books containing ads for baby supplies, toys, and even college savings accounts. Everything from baby’s first poop, baby’s first smile (or was that gas? ), and baby’s first tooth to baby’s first steps to baby’s first day of school was recorded for posterity. Though parents now have access to the Internet and baby’s milestones are often recorded in a blog for all the world to see, baby memory books are still one of the most popular items when preparing for a new baby. Most expecting parents receive at least one baby memory book at their baby shower. Whether you are searching for a cheap baby memory book or a more elaborate, heirloom-quality memory book, you are bound to find something that meets your needs in today’s market. Remember, your baby’s memory book should be a record of your baby’s most important milestones and be a true reflection of your family’s dynamics. There are many family dynamics – parents of the same gender, single mom families, single dad families, adoptive families, grandparents raising grandchildren, and many other situations. With this in mind, I have chosen the heirloom-quality RubyRoo First Year Baby Memory Book, “All About Me”. One of the main attractions for me is the many holidays that are represented that cover a broad spectrum of people – just as the world does. The easy to remove pages makes it an effortless process to remove the pages that your family does not celebrate. This memory book is designed to represent all family dynamics – including, but not limited to, single parent families, LGBTQ families, adoptive families, and any other family dynamic. I chose this as the best baby memory book because it is completely customizable to fit your family dynamic and represent the values your family adheres to. Not only does it give your little one a great keepsake to remember all important milestones and firsts, but also portrays what makes a family – the most important ingredient – LOVE. 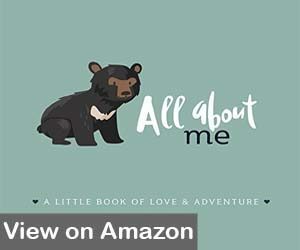 Other aspects that I find important are that this memory book is designed to be baby and environmentally friendly – and 1% of the proceeds are donated to charities that help improve the lives of those in need – creating an environment of charity and empathy that will serve your little one for the rest of her life.